German Chancellor Angela Merkel following a surprise arrived to Afghanistan on Monday amid growing tensions sparked as a result of Afghan civilians massacre by a rogue US soldier in southern Kandahar province. Merkel was to visit troops stationed in Mazar-i-Sharif in the north of the country, a spokesman said in Berlin. As her visit was announced, the Taliban vowed revenge against “sick-minded American savages” for the killing of 16 villagers including women and children in their homes in the province of Kandahar on Sunday. She originally planned also to visit Kunduz, another northern area where German troops are based, but bad weather meant it wasn’t possible to fly there. Germany, and several other Nato member states pulled their advisers from Afghan institutions after two members of the international force in Afghanistan were shot dead in violence over the Koran incident. 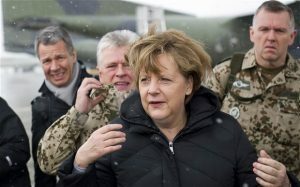 Merkel last visited Afghanistan in December 2010, to meet German soldiers just before Christmas. On that occasion she described the fighting there for the first time as “war”. Merkel spoke with Karzai by phone from Mazar-e-Sharif and offered her “personal condolences” following “the terrible actions of a U.S. soldier,” a German government spokesman said. She also assured him that the NATO-led security force in Afghanistan will do everything to clear up what happened, the spokesman said on condition of anonymity in line with department rules. Germany has some 4,800 troops in the NATO-led force in northern Afghanistan.